It's funny how a tradition begins and you don't even realize it until you are smack dab in the middle of it. This was our second year trekking to Hungry Horse Campground, located in Dorr, MI, just 30 minutes south of our home. Our stay was booked for two nights, Wednesday through Friday, and two cabins were reserved. The cabin we stayed in last year, Tucson, has a ramp, small bathroom and mini refrigerator. Auntie Karen and Oma were in their own cabin, Scottsdale, which included the same amenities, as well as an extra sink for doing dishes. Our camping homes were approximately 50 yards apart and Cam enjoyed traveling between the two locales. Upon arrival on Wednesday after unpacking, we headed to the pool. The solar-heated water was warm and inviting. There weren't too many other kids and an added benefit for us was utilizing the pool lift to transport Cam in and out of the water easily. 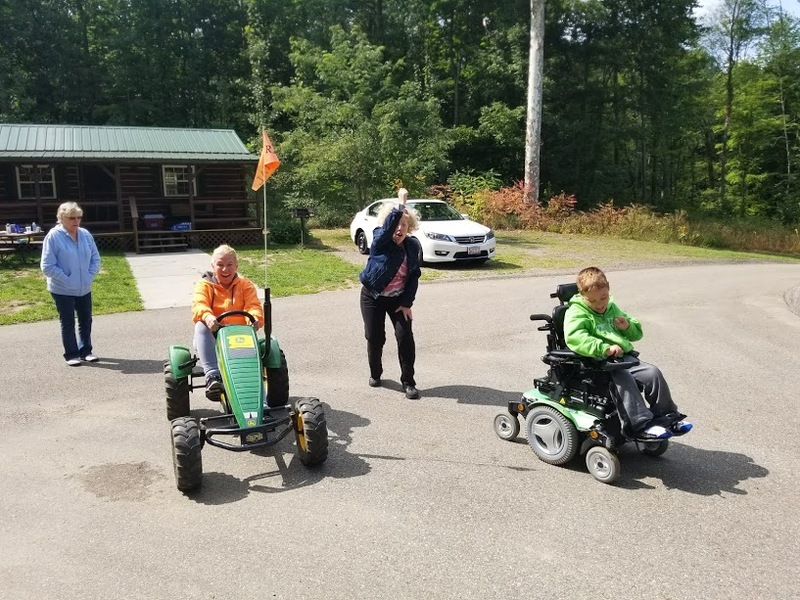 After a delicious charcoal-grilled meal of burgers and hot dogs, we headed over to the office area to join in our first ever Hungry Horse hayride! We didn't know what to expect. Our first stop on the ride was the owner's farm where everyone had a chance to feed the horses and cows. 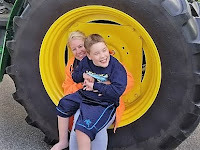 Cam and his mom also sat in the huge tractor tire pulling the hay wagon. By far, the most surprising part of the venture was going over some steep hills and bumps in the trails behind the campground. 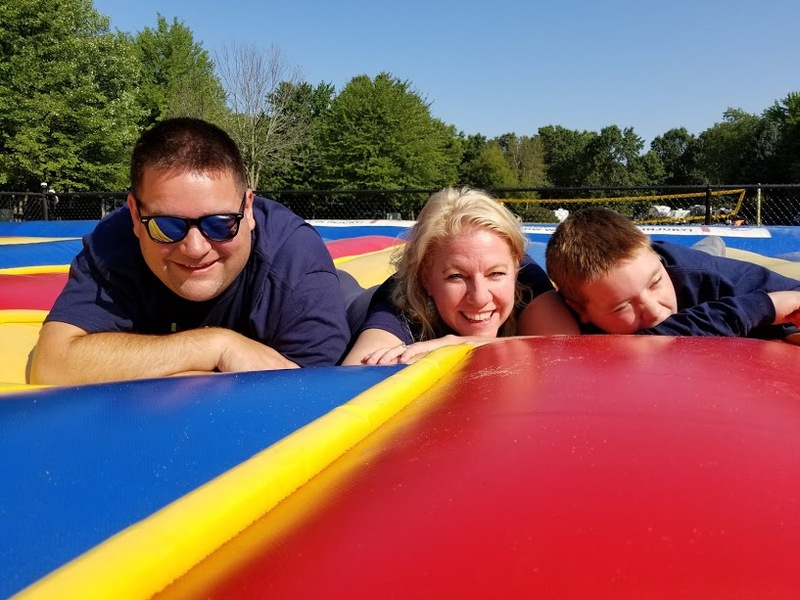 We were all taken aback by the rolling ride and our adventuresome kid could not stop laughing and thoroughly enjoyed the experience. 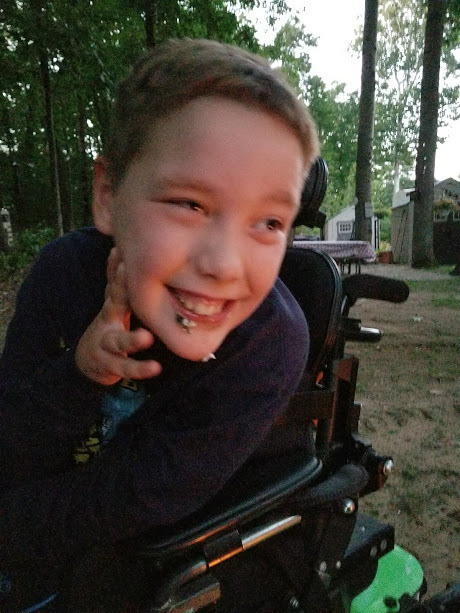 The evening was cool and the tasty s'mores and toasty campfire warmed our insides and outsides. Thursday morning, we awoke to rain showers. Oma and Cam played a family favorite, Yahtzee and both of them actually rolled a fairly high score. Chris and his son had planned a short fishing expedition and the sprinkles were not going to stop them. It turns out the first fish Cam caught wasn't a fish at all...it was a turtle! Since we didn't plan on turtle stew for dinner, the reptile was spared and released back to the lake. The ladies drove into town to partake in a coffee stop. After a delicious lunch and an afternoon movie viewing in the outdoor gazebo, the cloudy skies turned to bright sunshine and we were once again off to exploring. New to the campground this year was the addition of pedal bikes in the shape of tractors. For a small fee, you were able to ride around the area for 30 minutes. Cam decided we should race and each time we went, a new leader was chosen. Auntie Karen counted us down for takeoff. Everyone had a turn on the bikes and the area residents of seasoned rv campers welcomed our free wheeling and cheered us on. We realized that for once, Cam was able to see us at his own level while on his powerchair. It may be why he didn't want to see our time expire on the fun cycles. Besides two playgrounds, Hungry Horse also owns an inflatable jump pad. This larger than life platform feels like a buoyant trampoline. 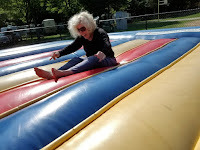 We had a blast taking turns bouncing each other and Auntie Karen showed off her jumping skills as well. 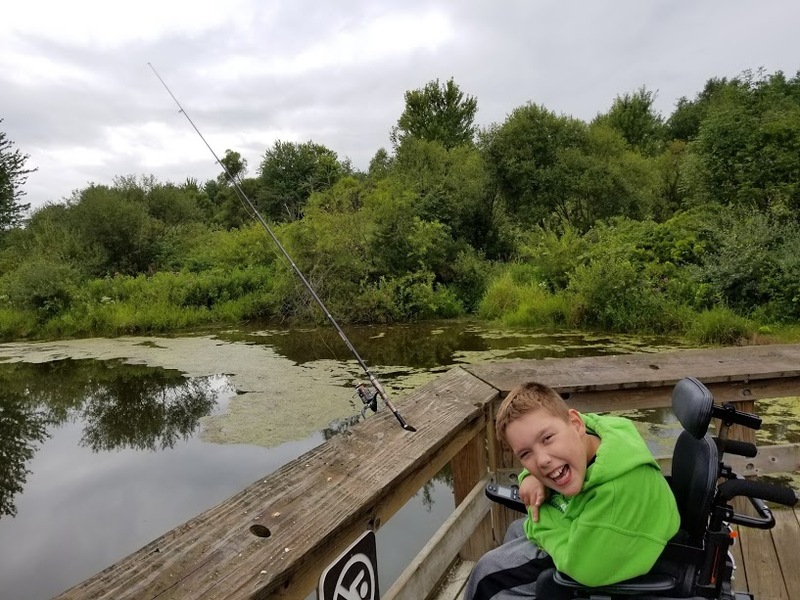 The couple who runs the campground don't market their establishment as being accessible, but it is truly one of the most unrestricted places we've stayed. The country feel of the atmosphere, the fellow campers, and the surrounding area have drawn us in. Prior to checking out on Friday, we were already making our plans for summer 2018 and agreed that a three night stay would be better than two. 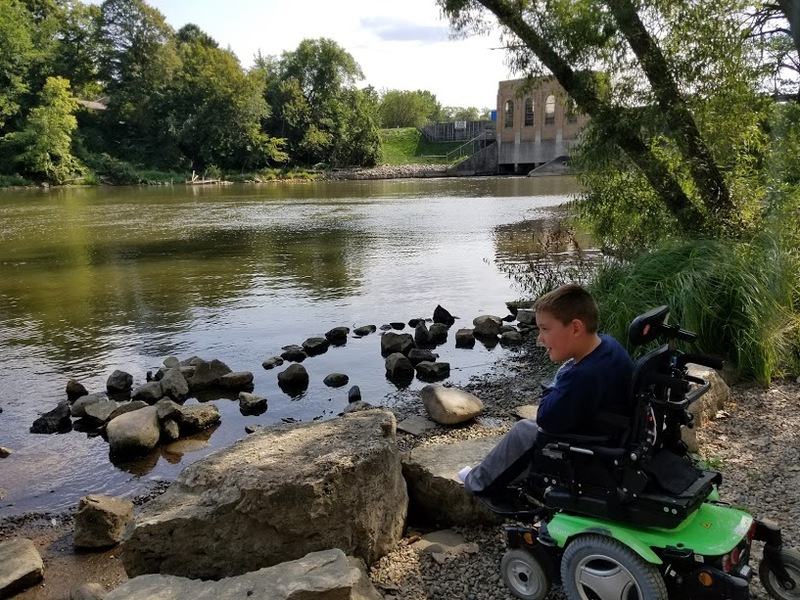 On Saturday, back in Grand Rapids, Cam and his dad found a perfect spot for fishing less than five minutes away. The newly inspired fisherman is intent on catching an amphibian next time! Mom, we should pay it forward! While helping his dad in the yard, Chris asked Cam what the name of his business should be. Chris asked: "Do you have music service?" Unfortunately, that is not available at this time, but we are working on it for the future.